Xbox One version reviewed. Review code provided by the publisher. Dungeon of the Endless, despite its name, offers short bursts of intense action overlaid with a beautiful pixel art design. 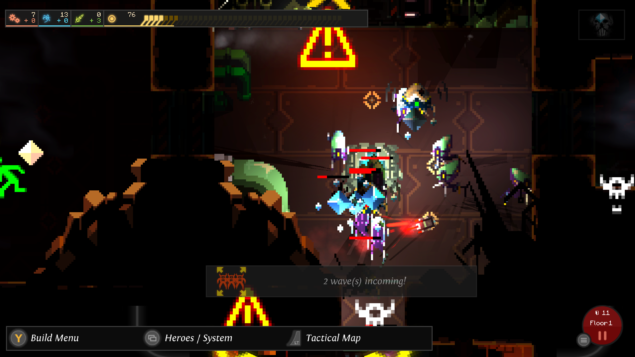 Being a roguelike dungeon crawling tower defense game means it’s a mouthful to explain, and you’ll be failing an awful amount of time and restarting to try all over again. After your space prison barge crashes, to put it mildly, you must aid two survivors through a labyrinth of dark tunnels and mysterious rooms. As you slowly unravel the map, door by door, you’ll encounter scuttling monsters, ancient artifacts and hopefully the exit. Once you know where you’re going, all you have to do is grab the crystal you’ve been protecting and get there. 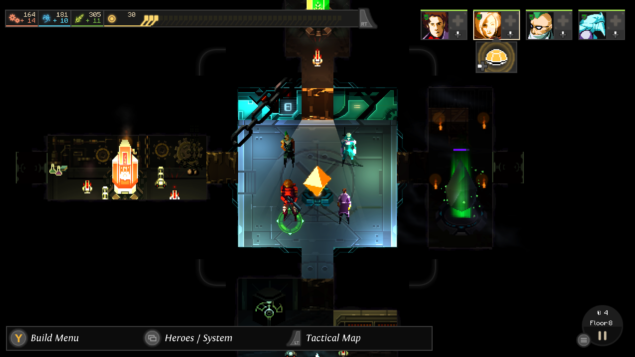 Dungeon of the Endless walks an intriguing line between turn based and real strategy as you navigate the dangerous mazes. Events will only occur when you make a move, standing perfectly still is perfectly safe, although it won’t get you very far. Opening doors counts as a turn, your resources will grow and research will near its completion with each new room you investigate. It can also startle a wave of monsters to rush from the every corner of the tangle of chamber unseen. This, along with your daring escape is where the tower defense aspects of the game take hold. The nodes in each and every room allow you to build turrets, shields, buffs and even mini factories as these defenses don’t come cheap. You’ll be responsible for gathering your resources throughout the dungeon and deploying them safely. Protecting your territory can be a difficult task, monsters can break your defenses or rush straight past them, and your heroes are easily slain. Combat is unforgiving, but fairly uninvolved. Your characters will hack, shoot or stab at anything hostile in the room automatically. Although they have some special abilities you can activate, most of your time spent in combat is keeping everyone health at a workable point. You’ll see hit points drop dramatically in combat, and although your heroes instantly heal outside of combat, death is sudden and permanent when monsters are creeping about. Healing also costs the food resource which is what you need to level your heroes up as well, balancing this, relying on turrets and retreating rather than healing are all important tactics to try in The Dungeon of the Endless. This does unfortunately make the issue of the controls slightly more noticeable. Like a lot of indie games appearing on the console scene, Dungeon of the Endless started its crawl on PC. As such the game is clearly not fully designed to support a controller interface. Having to manually swap between heroes to heal them, or move them can be annoying and difficult as you have to be constantly aware of who you are controlling. With the HUD being fairly minimal, it can be difficult to tell who you are controlling when the rooms are filled with pesky little demons. 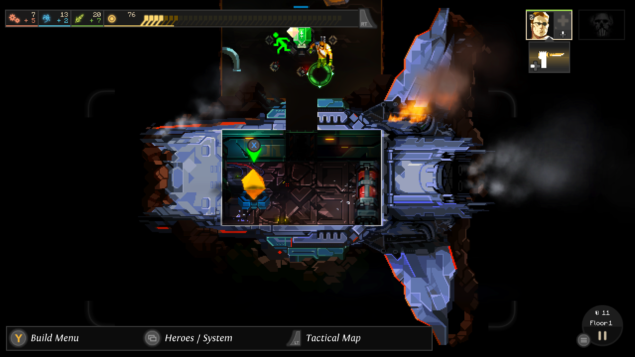 Dungeon of the Endless has that almost addictive sense of ‘just one more try’ about it. Every failure, however late or early in the game, prompts you to start again and do a little better. It’s a shame that sometimes arguing with the controls gets a crucial character killed and can throw the whole attempt, but you’ll still want to play it again. Like other Roguelikes out there, it is worth spending some time on the easiest difficulty setting, just so you can unlock a few helpful features. With a collection of escape pods that can buff or unexpected expedition, and a cast of characters to be unlocked, having these available can really help you in your many attempted adventures. There is a multiplayer mode, allowing up to four players to each control a character, but the servers are not well populated and you’ll spend just as look in the dungeon as you will searching for someone to join you there. And even if you do find a fellow adventurer to explore with, there is no guarantee that they will have any more idea of what they are doing, leaving you to do all the work with half the resources. But what you start with isn’t all you have to play with. Throughout your crawling you might just bump into merchants to stock up from, artifacts to research new modules from and wandering heroes to hire. Nearly everything has its tongue firmly lodged in its cheek and it’s enjoyable just reading the brief description of items. It’s always surprisingly calming between pushing back wave after wave of unpleasant enemy. The enemies are incredibly varied, each with their preface of prey. Some will hunt your heroes across the map, others will seek after your factories and some will run straight for your power crystal. You’ll start to recognize the different types of enemy, and you’ll constantly be readjusting to best put them down. The whole art of the game is beautiful. The monsters are impressively monstrous, with some zombie-esque creatures attacking with their guts out, while other bugs scratch across the floor in swarms. The maps change from floor to floor and it’s a treat to explore such pretty if morbid locations. It’s the same for the heroes as well, they are all beautifully distinctive and create a nice distinction from one another, and the world around them. Dungeon of the Endless is a remarkable game. While it doesn’t have the level of control you might want from such an intense controlling game, it has some impressively unique aspects that create a game you’ll be coming back to, at least until you manage to beat it once. There are some issues with it, from the controls to the spike of difficulty and lack of explanation, but there is enough good and interesting in these rotten walls to explore over and over again. Nothing quite feels as good as improving on your last performance, when you learn about a nice strategy or find a useful item to hunt for next time. And it is that feeling that will have to reaching back for the controller just one more time.